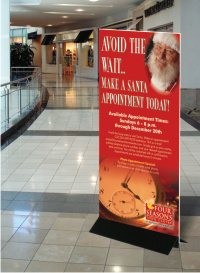 Product Description: Our panels signs (also called T-Stand signs) are double sided full color print on foam board panels. Choose from three panel sizes. Base has concealed bolts and wing nuts for clamping our ½" thick foamboard panels. Recommended for indoor use only. Available for order with or without our Mighty Mount™ steel base. PRODUCTION TIME: 2-3 business days after art approval. Please note, oversized shipping charges apply. Printed same image each side. If you would like different images/layouts on each side, please indicate so in your customization. If ordering with design, please indicate your choice of design on side one and side two copy in your customization. Additional art setup charges will apply. SETUP FEE: A $25.00 setup fee applies to orders of 7 items or less of a given design and layout. The setup fee is waived for this design if it isn't customized (your logo is always included at no additional cost). Setup fees are automatically added to your shopping cart.